One of the things I've recently wanted to have in my equipment bag as a youth baseball coach was a radar gun. This desire grew bigger as my oldest son Ethan started high school ball. I began to wonder if he had the velocity to be a respectable pitcher. Last year as a sophomore, Ethan recalled a funny moment when he came in to pitch in relief. As he began his warmups on the mound, the opposing coach yelled to his players, "That pitcher is just fooling you! There's no way he throws that slow! He's trying to lull you into a false sense of confidence! Be ready when you step in the box!" Of course, my son really wasn't pitching slow on purpose; that's how he normally pitches. Ethan got the opposing team out—not because he blew pitches past the opposing batters but probably because the other team weren't used to facing such slow pitching...lol. So now I was curious: just how slow is he really? And while I'm wondering, how fast/slow do my other boys pitch? And how fast is the fastest pitcher on my boys' teams? And how fast is the fastest pitcher on the opposing teams? I started watching Stalker Sport II radar guns on eBay because the new ones were too pricey at $500. I was hoping to find someone trying to unload their gun used for maybe $300. On occasion, there would indeed be an auction at that price but then other bidders would come in and inevitably drive the price up to $450. So I thought I would never get a gun at the price point I was comfortable with. Then along comes the Pocket Radar, Ball Coach model. Just to clarify: "Pocket Radar" is the company and "Ball Coach" is the model...kinda like "Toyota" is the company/make and "Sienna" is the model. 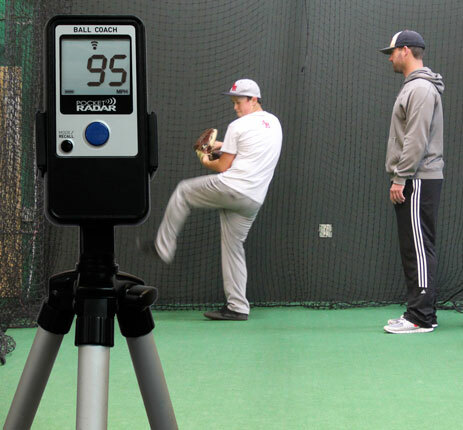 Pocket Radar makes other radar guns, but the Ball Coach is specifically designed for sports use. But if you want to call the Ball Coach "Pocket Radar", the Name Police aren't going to come after you. Call it whatever you like. In this article, I'll use both "Pocket Radar" and "Ball Coach" to mean the same thing too. The Ball Coach is not shaped like a traditional radar gun. It's shaped like a smartphone (circa iPhone 3, not iPhone X). That may turn off purists who want the thing to look like a traditional radar gun. But once you start using the Ball Coach, you'll never want to go back to the bulk of a traditional radar gun. The small size makes it easy to fit in your pocket so you can take it anywhere. And at only 4.5 ounces (~the weight of a quarter pound burger), you could keep it in its protective case, throw it in your equipment bag and not feel any weight difference. Don't let the convenient size fool you into thinking the Ball Coach is a toy. It is just as accurate as those more expensive Stalker guns. I tried a smartphone app that relied on math calculations to estimate speeds based on when you tap start & stop—now THAT was a toy. The Pocket Radar uses actual radar technology just like $1500 Stalker guns. This is no toy. You can get hands-free readings by mounting the Ball Coach on a flexible tripod like this, mount the tripod onto a backstop or fence and turning on the "Continuous On" feature. Using this feature does drain the batteries (2 AAA) a little faster than not using the "Continuous On" feature, but it can be a helpful feature when you need it. For example, you may want to take notes while recording readings onto a notebook and this feature can let you focus on writing instead of holding the Ball Coach to take the reading, then putting the Ball Coach down to write down notes and repeating over and over. It stores the last 25 readings in its memory for you to scroll through. Pretty convenient if you want, say, your kid to throw 5 pitches uninterrupted, where you can read the readings afterwards. At 60% of the cost of the cheapest Stalker gun, the $300 price point makes the Pocket Radar more accessible to the casual coach. You don't have to be a college coach or scout anymore in order to have a radar gun. I'm not saying all casual coaches can afford $300, but it's sure more palatable to spend $300 than $500 on a gun. Honestly, I can't think of a single one. I guess I wish it was cheaper even than $300 but that's kind of like saying "I wish Nike shoes were only 10 bucks!" This is a no-brainer. If you can afford $300, I think this is one of the most useful tools you will use, whether as a baseball parent or as a team coach (or both). 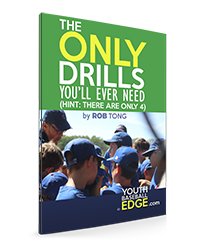 Not only is it useful but I think you will be using it at every practice, so you'll get a lot of use out of it, unlike a lot of other coaching tools on the market. 5 of 5 Edgy Balls: Outstanding. If you can afford it, this is a must-have.